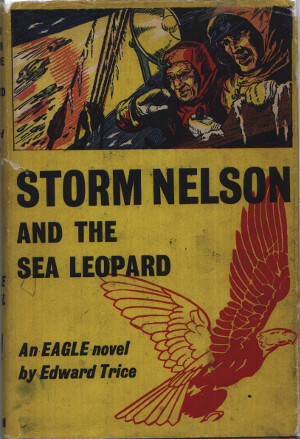 Storm Nelson and the Sea Leopard begins with a radio message from a whaling company, and so Storm sets out for the Weddell Sea to solve the mystery of three missing catchers, with nothing to guide him in his search except the drawing of a sea leopard and the fear of a phony electrician. Dimensions : 13.5cm x 20cm with 159 pages. So Copper's in a jam, Storm mused as he leaned back and basked in the hot sun. "Don't half pong, sir," Spanner commented. "Jiminy!" Storm crashed his fist into his palm. "So that's it - piracy!" "By jingo, Bash, we've found it!" he shouted over the chaffcutter roar of the engine. "Listen, Spanner; we're on our way, but they've got the water-front lit up like Blackpool Promenade." "Sir, bacon and eggs down below for two, sir!" "Losh, Skipper, it's unbelievable!" Jonah murmured at last. "What would they say in Auchtermuchty?" "How do you know I would respect such a bargain, and how could I trust your word?" By thunder, Commander Nelson, we were beginning to fear that you had gone the way of our whale-catchers." Just one final effort." he hailed the catchers. "Stand by as we open fire!" "Well, chaps, I feel rather glad that the Antarctic has reclaimed its own."